Sashimi lovers will rejoice at the multitudinous options that Tsukiji Fish Market Restaurant has to offer for fresh seafood. They are one of the concepts available at Tsukiji Fish Market. The Bara Chirashi Don (S$21.80) is the ultimate go-to if you want a sashimi-centric meal and it is one value-for-money dish at that—topped with generous portions of diced salmon, tuna, swordfish, crab, salmon roe and tamago. And there is also tobiko and a small portion of uni! Have a hankering for sashimi? 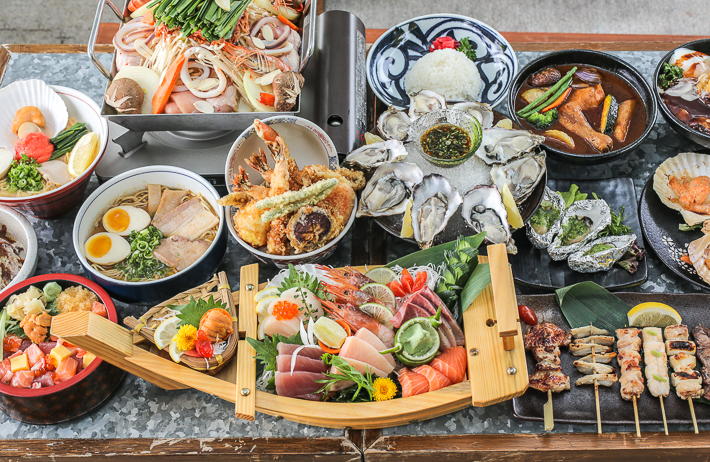 Go for the 7 Kinds of Sashimi on a Ship (S$41.80) which is gloriously presented with fresh cuts of sashimi in accordance to the season. Otherwise, the fresh Oysters is a great option for sharing too—creamy and easy on the salinity, these are oysters we would find ourselves returning for. 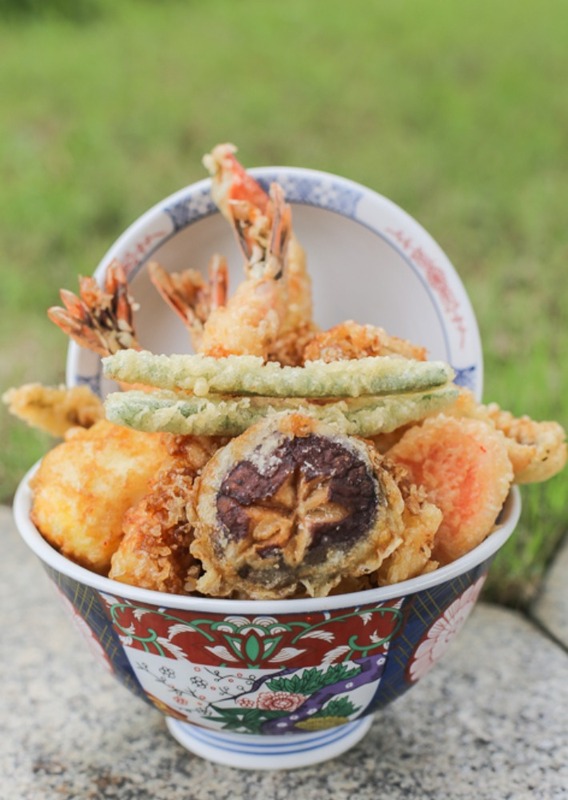 The Ebizo Tendon (S$22.80) from the Ebizo Tempura Restaurant is one hearty bowl that will definitely fill you up. The golden-brown batter which coated the tempura impressed us with its crispiness despite being doused in a sweet soy dressing. Generously topped with fresh ebi, sea eel, snow crab leg, squid, a tempura egg, and assorted vegetables, this bowl of goodness is sure to leave you satisfied especially if you are a sucker for such deep-fried goodness. Tori-Sho is yet another concept within Tsukiji Fish Market specialising in an extensive range of chicken-centric dishes. Look forward to new offerings by Tori-Sho Chicken such as the Chiritori Nabe, or opt for their classic smoky, charcoal-grilled Yakitori. Bearing an uncanny resemblance to that of Korean Army Stew, the Chiritori Nabe (S$36.80) is a dish that stands out amongst the rest. 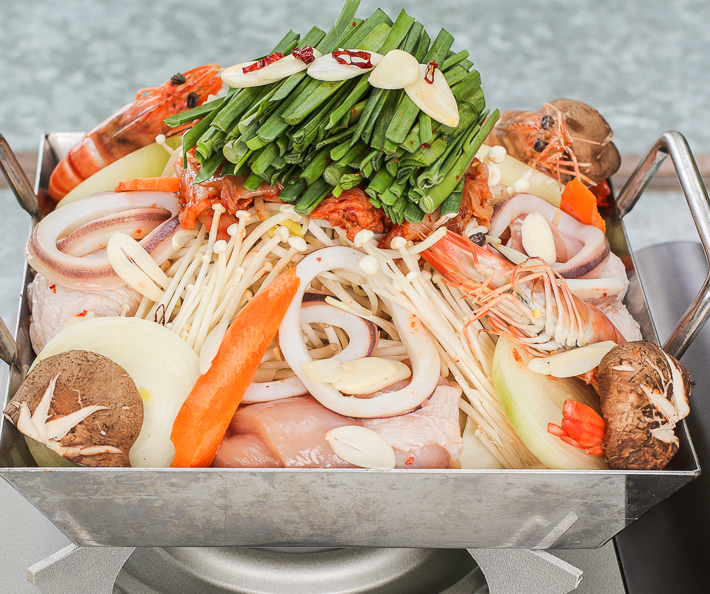 Think of it as a massive steamboat with overflowing ingredients such as mushrooms, prawns, squids, chicken dices as well as kimchi—all soaked in a pot of slightly spicy soup. From the mild spiciness of the robust broth to the plenteous ingredients that the dish constituted, we were sold by the complex harmony of flavours from this dish. 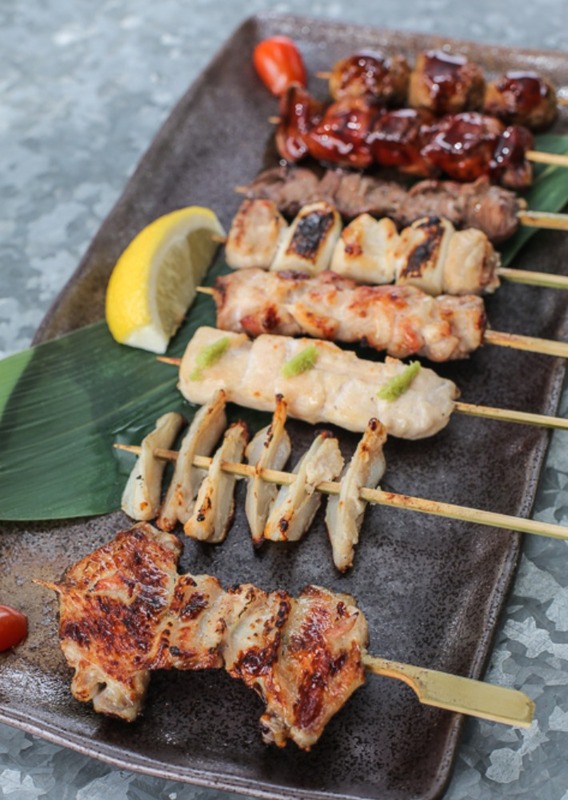 The Tori-Sho Chicken menu also includes an extensive variety of yakitori, such as the usual chicken thigh, wing and fillet section, as well as the more acquired innards and soft bone. Each yakitori skewer is grilled to perfection—we particularly loved those that were slathered with their in-house tare sauce that well complemented the intense smokiness of the grilled meats. With prices starting from just S$2.20 per skewer, we’d understand why it is so difficult to say no to these delightful sticks of goodness. Ramen is undoubtedly one of the most, if not the most, comforting Japanese food. Takumen Ramen Gallery serves a limited but tantalizing range of ramen so delectable it would make you go back for more. 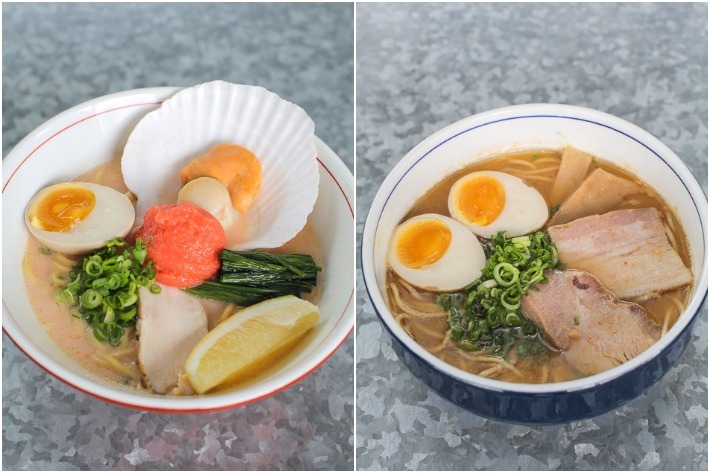 Ramen fanatics will be pleased to hear that Takumen Ramen Gallery has come up with new offerings—Mentaiko Ramen (S$16.80) and Wabisuke Ramen (S$16.80). For something more unconventional, albeit alluring, opt for the Mentaiko Ramen which features a sweeter-than-average broth. As its name suggests, Ikezaki Steakhouse has a wide range of beef-centric fare which serves as a good alternative if you are not a fan of the usual ramen and sashimi. Served with cherry tomatoes, avocados, an onsen egg and a huge, thick beef patty is the Loco Moco Don (S$19.80)—the newest addition to Ikezaki’s menu. For those who believe in the notion that thick beef patties will always turn out dry and hard, the one featured in the Loco Moco Don will prove you wrong with its juicy and succulent meat. The Wagyu Roast Beef Don (S$20.80) is another option to look forward to. If you are one that gets excited over the sizzling sounds of barbecue and watching fresh seafood grill under your nose, the Hamayaki Grill at Tsukiji Fish Market is one that will win you over. Let the chef in you shine and grill your seafood as you like! Their à la carte menu features options such as the Grilled Scallop with Mentaiko (S$13.80/ 3pcs), Grilled Oysters with Garlic Butter Sauce (S$12.80/ 3pcs) and the Grilled Sazae with Garlic Herb Butter Sauce (S$9.80/ 6pcs) which you wouldn’t want to miss out on. The Hamayaki Grill is available for à la carte during both lunch and dinner. Here’s a gentle reminder to quote ‘ladyironchef’ upon making reservations to enjoy 20% off your total bill. *Do note that this offer is only valid from Mondays to Thursdays, excluding public holidays and eve of public holidays, from 9th July 2018 until 31st August 2018. This promotion cannot be used in conjunction with other promotions, vouchers or offers. This post is brought to you by Tsukiji Fish Market Restaurant.